7mm 1/4" for Cassese underpinners soft wood v-nails. Each pack contains 5 cartridges. 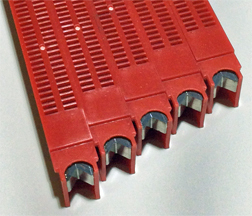 Each cartridge contains 280 vnails. There are 1400 total vnails in each pack. Guaranteed to work perfectly in all joiners that use the cartridge type vnail.